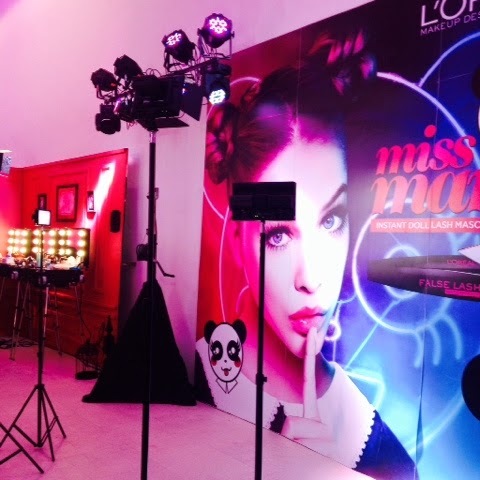 L'Oreal's Miss Manga has Arrived in Manila! | Vanity and Everything in Between. 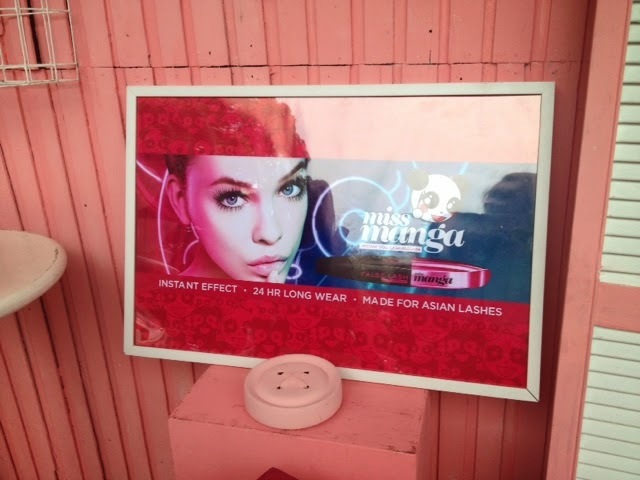 Earlier this week, L'Oreal launched their latest mascara in the Philippines - Miss Manga! Now, you ask what manga means. Is it the fruit or is it the Japanese word? It's the latter. Manga is a Japanese comic book. If you note the female characters in Manga (and even in animé, I guess), they sport full and flary lashes. That is what this Miss Manga mascara is trying to achieve. By the entrance you will be greeted by a pink setup of why seem like a part of a doll house. Of course, there's a frame about Miss Manga. It is her doll house after all. 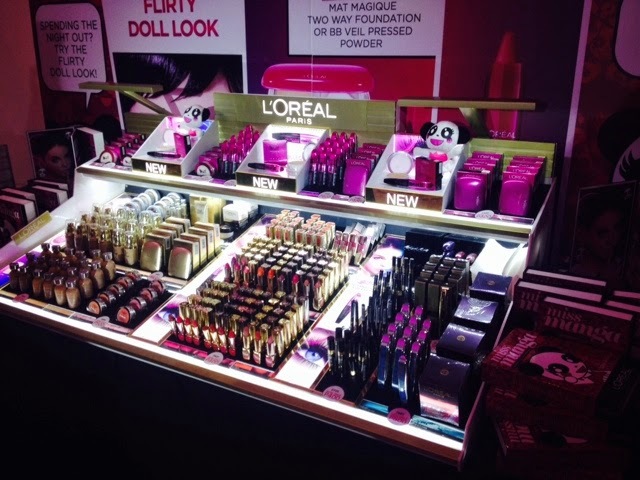 L'Oreal counter on the right side from the entrance. Eep! 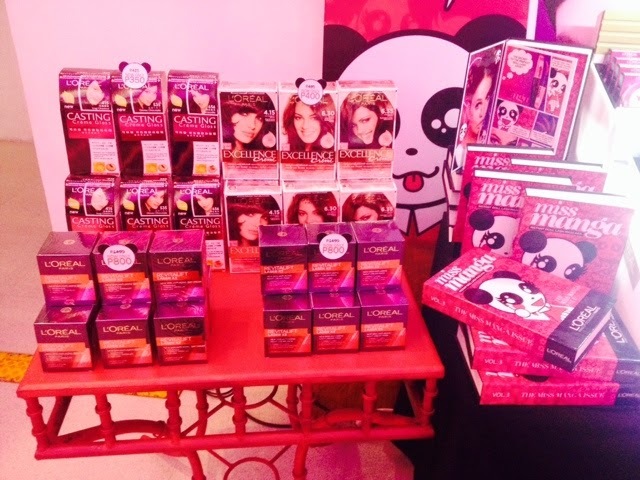 L'Oreal product are on sale! I took Miss Manga to our cocktail table for a photo op. anything that we like on the makeup counter. On top of that, we were given this nice press kit that mimics a hardbound book. 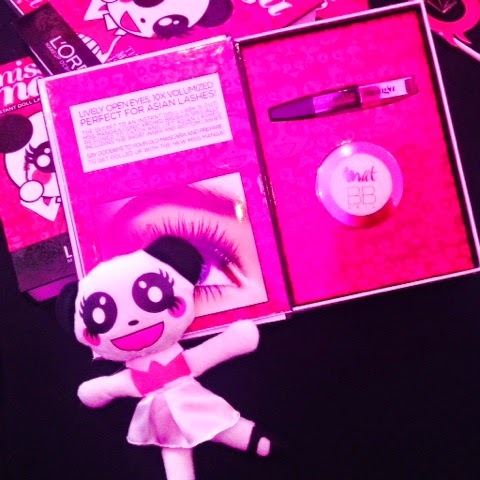 Inside, you'll see the Miss Manga mascara and Mat Magique veil powder. Here's my loot from the event! I was thinking of getting a face powder but I still have face powders at home and my Mat Magique powder foundation is barely used! I decided to get a liquid foundation instead since the press kit comes with a veil (pressed powder). I've heard good things about True Match so I hope this shade is really my true match! There were a lot of lipsticks to choose from and I thought of spending all of 1,500 on lipsticks. But then, the lipsticks available were either satin, moisturising, very bright or with shimmer. I didn't find a shade I couldn't resist so I changed my mind and got an eyeliner instead. I don't even remember if I've tried any L'Oreal eyeliner. So, this must be my first. The lastly, I got a blush (light pink shade, of course) to diversify my kit. You might be wondering how I was able to purchase 3 products with only 1,500.. I have good news for you, guys! 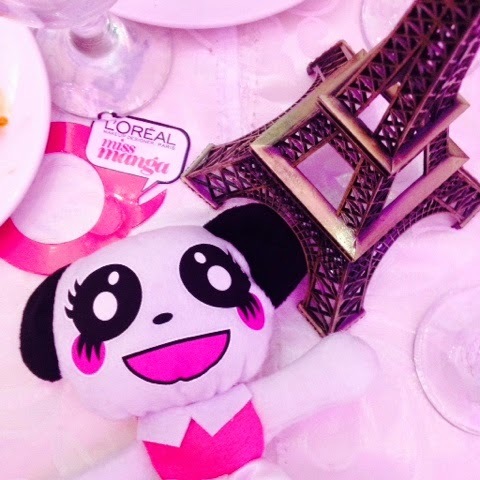 L'Oreal is going to have a 'L'Oreal Great Sale' starting May 1 (up to 30% off)! 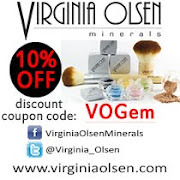 The prices of the products during the event were the sale prices so I was able to purchase 3 products! 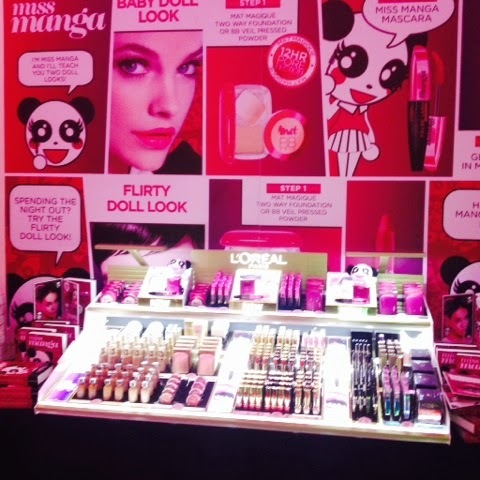 The liquid foundation will be on sale for PhP600 (from 800++). The liquid eyeliner will be one sale for PhP400. 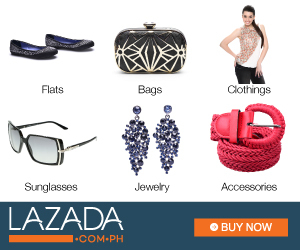 The blush will be on sale for PhP500. I find the blush still pricey even after deductions. I don't know, what do you think? 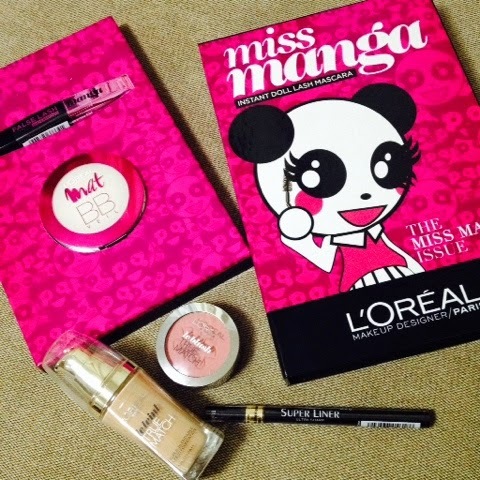 Let me know which one you want me to review first aside from the mascara! Eyeliner Ms. Gem,please do a review havent tried any of their eyeliner. That's such a cool press kit! 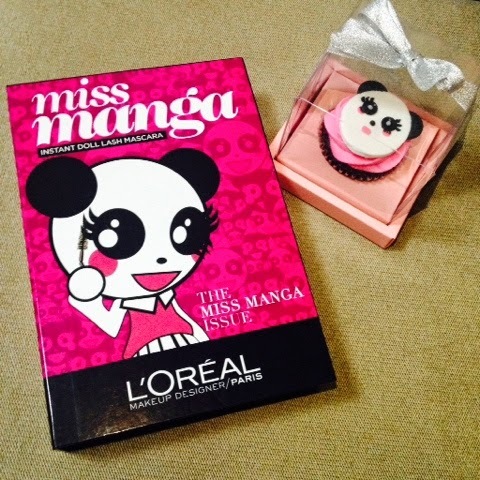 I'm a little surprised that they went for a Manga look as that's something I had never thought of likening to the very Western L'Oreal brand, but I notice that Western drugstore brands have been open to adapting a more Asian theme with their products (e.g. that vibrating mascara wand from Maybelline). It's certainly a new look for them. Cute ang panda. Hehe. 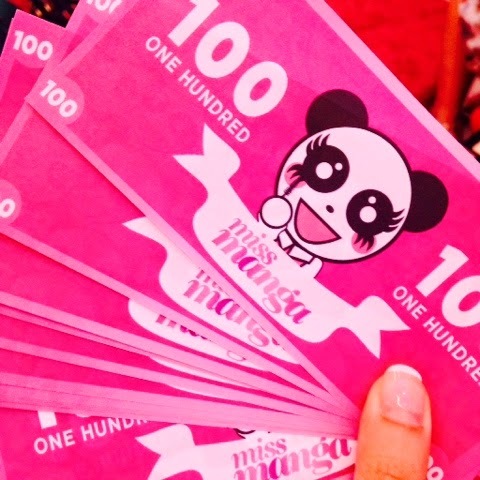 It's like Miss Manga is screaming, "Look at me and my big eyes!"